We have good news to share! 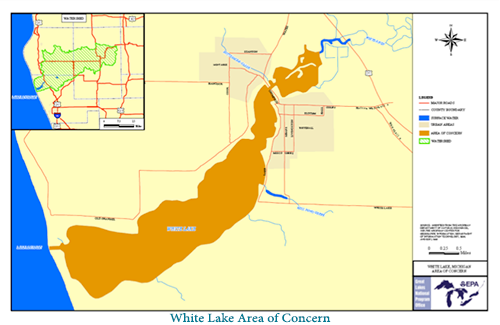 White Lake was delisted as a Great Lakes Area of Concern in October 2014! View our documentary video, Bringing Back White Lake the Beautiful, for this great story! Following that, members of the White Lake Public Advisory Council began a strategic planning effort. The goal of the effort was to determine what needs to be done to maintain progress at restoring White Lake, address continuing and future issues, and advance long-term citizen stewardship. The group determined that a collaborative stakeholder approach was warranted to accomplish this, and initiated formation of the White Lake Environmental Network (WLEN) in May 2015, which has adopted a Strategic Plan for 2015-2018*. *Click on the link to view the article. It will open as PDF. For more information about the strategic planning process, please see the page, Planning for White Lake's Future Beyond Delisting. The City Clerk for Whitehall is the current contact for this new effort, and can be reached by phone at (231) 894-4048. The White Lake Public Advisory Council (PAC) would like to thank the White Lake Community Library for allowing us to include the web pages of the PAC on the Restoring White Lake website as part of its White Lake Environmental History Project.